John Sidney McCain III, aka John McCain, is a Republican United States Senator from Arizona. He was the Republican presidential nominee in the 2008 United States election. 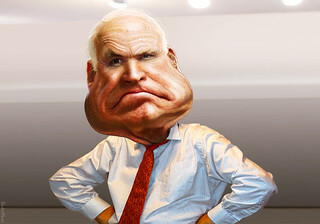 The source image for this caricature of Senator John McCain is Creative Commons licensed photo from Marc Nozell's Flickr photostream.